1622 – In the first Indian attack in years, 250 American settlers at James River have been killed. 1824 – Parliament has agreed to spend £57,000 on the purchase of 38 paintings to establish a national collection. 1829 – A conference in London has agreed the boundaries of Greece, finally independent of Ottoman rule after nearly 400 years. 1832 – Death of Johann Wolfgang von Goethe, aged 82. 1888 – The English Football League is formed in a hotel in Fleet Street, London. 1904 – The ‘Daily Illustrated Mirror’ in America runs the first colour newspaper pictures. 1906 – England beats France 35-0 in the first rugby international, played in Paris. 1907 – Mohandas Gandhi, a young Indian lawyer, trained in London, is leading a campaign of civil disobedience by Asians in South Africa to protest against new laws that require the entire Indian community to carry passbooks and register their fingerprints. Gandhi’s campaign uses the principle of non-violent protest he calls ‘satyagraha’ or ‘steadfastness in truth’. 1907 – The first taxis with fare meters are used in London. 1933 – The ruling National Socialists party, under the German Chancellor Adolf Hitler, has today opened a concentration camp at Dachau, near Munich, to detain communists and other ‘political undesirables’. Under emergency legislation approved last month after the Reichstag fire, the government can detain anyone, and the majority of those being rounded up are Jews. 1942 – The BBC begins broadcasts in morse code to the French Resistance. 1945 – The Arab League is formed by 7 Middle Eastern countries – Egypt, Saudi Arabia, Syria, Lebanon, Iraq, Jordan, and Yemen – to coordinate political actions and safeguard their sovereignty. 1988 – In Australia, doctors have, for the first time, turned off the life support machine of a terminally ill patient. 1990 – The Baltic republic of Lithuania has been given 48 hours by Moscow to disarm and disband its militia forces. Soviet President Mikhail Gorbachev has warned the rebel republic he will strike back at its declaration of independence, announced 10 days ago. 1752 – Canada’s first newspaper, the ‘Halifax Gazette’, is published. 1765 – The Stamp Act comes into force; all publications and legal documents in British colonies will now be taxed. 1801 – Tsar Paul I has been murdered by a group of drunken Russian army officers. The mentally unbalanced ruler was strangled in his bed. His harsh rule alienated the military and his people. His mother, Catherine the Great, conceived him in an adulterous love affair. They fought bitterly, and she isolated him from his sons and tried to disinherit him. After her death in 1796, he decreed that no woman could ever rule again. 1815 – The British Corn Law halts the import of grain. 1861 – London's first tramcars start running in Bayswater. 1918 – Big Bertha, a giant German gun, begins shelling Paris from 75 miles away. 1919 – A group of disillusioned former socialists and Italian war veterans in Milan have formed a political party, led by Benito Mussolini, the editor of ‘Il popolo d’Italia’. They call themselves the Fasci di Combattimento, after the ‘fasces’, the axe that was the symbol of ancient Roman authority. The ‘Fascists’ believe the answer to Italy’s problems is a strong state. 1925 – The US state of Tennessee has outlawed Charles Darwin’s theory of evolution. Governor Austin Peay has signed a statue forbidding Darwin’s work to be taught in state schools on religious grounds. 1933 – The German parliament has passed a bill allowing Adolf Hitler to rule by decree, thus establishing a dictatorship. 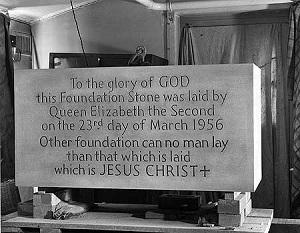 1956 – Queen Elizabeth II laid the foundation stone of the new cathedral being built in Coventry. The old 14th century cathedral and most of Coventry’s medieval city centre was destroyed by a single 11-hour air raid by the Luftwaffe on 14 November 1940, which killed over 500 people. 1966 – The first official meeting between the heads of the Catholic and Anglican churches for 400 years takes place in Rome. 1983 – Death of Barney Clark, the retired American dentist who was the recipient of the first artificial heart, the ‘Jarvik-7’. It gave him an additional 3 months before he died of circulatory collapse and other problems associated with the new heart. Even so, his doctors are still describing it as a success. 1983 – President Ronald Reagan refers to the Soviet Union as “an evil empire”, and proposes a ‘Star Wars’ defence system. 1984 – Sarah Tisdall, a British civil servant, has been jailed for 6 months after leaking information to the ‘Guardian’ newspaper that Cruise missiles were on their way to Britain. 1603 – Death of Elizabeth I. Her 45-year reign made England the leading Protestant and maritime power of Europe. 1839 – China is attempting to crack down on the ruinous opium trade with troops blockading the foreign traders’ warehouses in Canton. The Emperor’s special envoy, Commissioner Lin Ze-xu, has ordered the foreign merchants to surrender more than 20,000 chests of the illegal drug, which is worth more than $12 million. The merchants have little choice but to comply, although there is no doubt that the trade will continue. The opium trade, which is damaging China morally and financially, began to flourish when the merchants found a way of forcing the Chinese to accept payment other than hard currency for its tea. The opium could be obtained cheaply in India, and no longer was the London exchequer being drained of silver. 1877 – For the first time, the Oxford and Cambridge boat race has ended in a dead heat. 1882 – Death of Henry Wadsworth Longfellow, aged 75. 1905 – Death of Jules Verne, aged 77. 1911 – Denmark abolishes capital punishment. 1922 – Of the 32 horses that ran in the Grand National at Aintree, only 3 finished. 1938 – Neville Chamberlain, the British prime minister, has said he will not oppose Adolf Hitler’s annexation of Czechoslovakia in the interests of avoiding war between Britain and Germany. 1953 – Death of Queen Mary, widow of King George V, aged 85. 1976 – Death of Viscount Montgomery of Alamein, British Field Marshall and Commander of the 8th Army in the Second World War. 1988 – Mordecai Vanunu has been sentenced to 8 years in prison by an Israeli court for revealing details of Israel’s nuclear programme to the ‘Sunday Times’ in London. 1989 – The US Congress has agreed to renew a $40 million aid programme for the right-wing Contra rebels fighting Nicaragua’s Sandinista government. The funding had been stopped during the Iran-Contra scandal. 1990 – Indian peacekeeping troops pull out of Sri Lanka. 1306 – Robert the Bruce, the 8th Earl of Carrick, is today crowned King of Scotland, becoming Robert I. 1807 – The British parliament abolishes the slave trade, thanks largely to the influence of the philanthropic MP, William Wilberforce. 1815 – A new alliance has been formed against Napoleon Bonaparte, comprising Britain, Austria, Prussia and Russia. 1876 – In the first football match between Scotland and Wales, Scotland wins 4-0. 1918 – Death of Claude Debussy, aged 55, after a 9-year battle against rectal cancer. 1929 – Benito Mussolini wins 90% of the vote in the Italian elections. 1949 – The film version of ‘Hamlet’ has, today, won 5 Oscars, including Best Picture. Lawrence Olivier, who starred and directed the film, has won the Best Actor award. 1957 – The European Economic Community is formed today with the signing of the Treaty of Rome by the leaders of the 6 founding member-states – France, West Germany, Italy, the Netherlands, Belgium and Luxembourg. 1958 – Sugar Ray Robinson, the great American boxer, has won the world middleweight title for the 5th time. He was born Walker Smith, and took his well-known moniker from a friend’s birth certificate he had borrowed so he could fight while still under-age. 1975 – Death of Saudi Arabia’s King Faisal, murdered by his nephew, 31-year-old Prince Faisal ibn Musaid, who is said to be mentally unstable. The king’s death is a diplomatic blow as he had been a moderating influence in the volatile political condition of the Middle East. 1989 – The 987-ft super tanker, ‘Exxon Valdez’, which ran aground on a reef in Prince William Sound, Alaska, yesterday is now releasing as much as 11 million gallons of crude oil into the open sea. The area is rich in marine wildlife and fishing stock. Although the cause of the accident is, as yet, unknown, the US Coastguard has subpoenaed the tanker’s captain and 2 crew following rumours that the crew had been drinking. The ship’s owners, Exxon Shipping, have promised to pay for the clean-up. 1990 – A disco fire in New York has killed 87 people, mainly young immigrants. The Happy Land Social Club, a popular place for Hondurans and other Central Americans, was a firetrap lacking sprinklers and fire exits; there was only 1 exit, and a ‘vacate’ order from 16 months previous had not been followed up. The fire was caused by a jilted lover, who torched the place. 1827 – Death of Ludwig van Beethoven, aged 57. 1878 – The world’s first game reserve – the Sabi Game Reserve in South Africa – is designated. 1892 – Death of Walt Whitman, the American poet, aged 72. 1902 – Death of British imperialist, Cecil John Rhodes, in Cape Town, aged 48. He controlled 90% of the world’s diamond production, and in 1890, became prime minister of the Cape Colony. 1923 – Death of Sarah Bernhardt, the French actress, aged 78. Loved around the world, she had a long and very successful career. After injuring her right knee while on tour in South America, she had to have her leg amputated in 1915. Undeterred, she was back on stage 9 months later, performing with a wooden leg. 1942 – The start of Jews being sent to Auschwitz concentration camp. 1945 – Death of David Lloyd George, former prime minister, aged 82. 1959 – Death of Raymond Chandler, aged 70, and with him, his most famous creation, the private investigator, Philip Marlowe. 1973 – Death of Noel Coward, the British dramatist, composer and actor, aged 73. 1979 – The leaders of Israel and Egypt have signed a historic peace treaty, witnessed by President Jimmy Carter. Israeli Prime Minister Menachem Begin and Egyptian President Anwar Sadat have agreed to restore diplomatic relations, and there is real hope that 30 years of conflict between the 2 nations may now be resolved. 1983 – Death of Anthony Blunt, aged 75, the so-called ‘Fourth Man’ of Britain’s upper-class spy ring. He was the Cambridge spymaster who recruited Donald Maclean, Kim Philby and Guy Burgess to the communist cause in the 1930s. 1794 – The US Navy is established. 1813 – Prussia declares war on France, and Russian forces occupy Dresden. 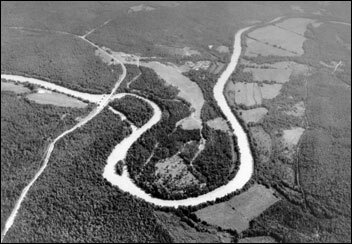 1814 – At the Battle of Horseshoe Bend in eastern Alabama, troops under General Andrew Jackson defeated the Creek Indians, with more than 800 Indians losing their lives. Much of the Creek Indians’ territory in Alabama and Georgia will now be brought into the United States. 1871 – In the first international rugby match between Scotland and England, the Scots beat the English 2-1. 1914 – The first successful blood transfusion is performed in a Brussels hospital. 1964 – Britain’s Great Train Robbers are sentenced to a total of 307 years imprisonment, having been found guilty of stealing more than £2.6 million from mail bags. 1968 – Death of Yuri Gagarin, aged 34. The first man to orbit the earth, he died in a plane crash near Moscow. 1977 – Two Jumbo jets have collided at the Los Rodeos airport on Tenerife, claiming 583 lives. Many aircraft, including both Boeing 747s, one belonging to KLM and the other to Pan Am, had been diverted from Gran Canaria airport after a bomb explosion, and the threat of a second bomb. Many airplanes had to be parked on the runway at Los Rodeos, blocking it, and visibility was further reduced when a dense fog developed. Because of the parked aircraft, both 747s had to taxi on the only runway to get in position for take-off. Neither could see the other because of the fog, and the controller in the tower could not see the runway or either of the planes. Due to subsequent misunderstandings, the KLM plane tried to take off while the Pan Am flight was still on the runway. The resulting, overwhelming fire killed all 248 KLM passengers and crew, and 335 on board the Pan Am plane, with 61 survivors. 1980 – A North Sea oil platform, about 250 miles from the Scottish coast, has overturned during a storm with over 100 men feared drowned. 1981 – Poland’s union leader, Lech Walesa, has urged millions of Polish workers to stage a general strike in protest at police harassment of activists belonging to the independent trade union, Solidarity. The strike is a show of strength against hard-line communists. 1868 – Death of Lt-Gen James Brudenell, the 7th Earl of Cardigan, who led the ill-fated ‘Charge of the Light Brigade’, aged 70. 1871 – Paris has today been proclaimed a “commune of the people” by patriotic French radicals filled with the passion of the Revolution of 1789. It is being led by intellectuals and workers, backed by a reformed National Guard; their aim is to set up a municipal government independent of the national government, which has fled to Versailles. 1881 – Death of Modest Mussorgsky, the Russian composer, aged 42. 1912 – Both boats in the Oxford and Cambridge boat race have sunk. 1920 – The King and Queen of Hollywood, Douglas Fairbanks and Mary Pickford, were wed today. 1939 – The Spanish Civil War has ended today after 3 years, with General Francisco Franco’s nationalist forces taking Madrid peacefully. The Republican government has fled to Valencia. The war has claimed tens of thousands of lives, with families split due to conflicting loyalties. Many observers see the Civil War as a bloody dress rehearsal for a larger European war. 1941 – The British Navy has sunk 7 Italian warships at the Battle of Matapan, off the island of Crete. 1943 – Death of Sergei Rachmaninov, the Russian composer and pianist, in California, aged 69. 1945 – Germany mounts its last V2 rocket attack against Britain. 1969 – Death of Dwight D Eisenhower, aged 78. 1979 – A meltdown has occurred in the nuclear reactor core of the Three Mile Island power station at Harrisburg in Pennsylvania, apparently caused by the failure of valves controlling cooling water, and subsequent operator mistakes. Although experts are warning that the reactor core may release radioactive clouds, there are no facilities for a general evacuation of the immediate area. 1980 – A mine lift cage at the Vaal Reef gold mine in South Africa has plunged more than a mile, killing all 23 aboard. 1985 – Death of Marc Chagall, the Russian-born painter, aged 97.